2000AD comic Prog #485 (30th August 1986) | 'TAIN'T THE MEAT… IT'S THE HUMANITY! 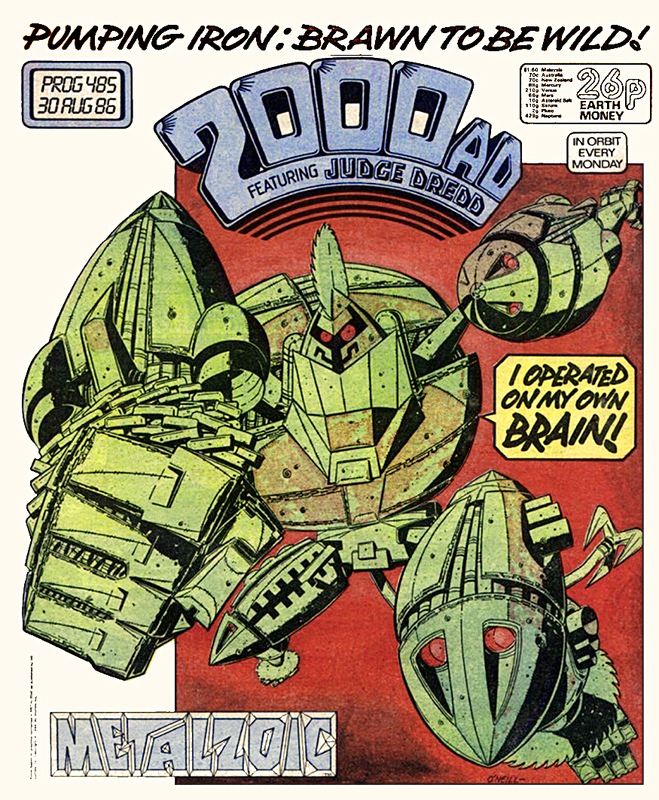 Prog #485 of 2000AD, the long-running weekly British science-fiction comic, featured psychotic robot Armageddon, star of Pat Mills and Kevin O’Neill’s frenetic strip Metalzoic. Cover dated 30th August 1986 the issue featured the third instalment of the ten-part Metalzoic, reprinted from the graphic novel published by DC Comics earlier that year. The story concerns a group of sentient robots battling over a future Earth long abandoned by humanity. The story, written by 2000AD veteran Pat Mills, was drawn by Kevin O’Neill at his frenzied best. And the cover for this issue is just terrific – the insane Armageddon just jumps off the page, and what about that cover-line: ‘I operated on my own brain!”. Classic 2000AD. I’ve been a fan of O’Neill’s work since the very early days of 2000AD, when I first read his Captain Klep strip in the late 1970’s. From there I followed him as his moved to a celebrated run on Nemesis the Warlock and then to the superhero satire Marshal Law, both written by Mills. I’m always attracted to artists with a unique style and nobody in the industry draws quite like O’Neill. His attention to detail is wonderful, as is his delirious style of drawing. Comic book legend has it that when the American Comic Code Authority objected to an Alan Moore penned tale from DC’s Tales of The Green Lantern Corps Annual in 1986, they cited O’Neill’s artwork style as the reason for rejecting the story in it’s entirety. I guess he just creeped them out too much! For the last 15 years O’Neill has mainly occupied himself with illustrating Moore’s League of Extraordinary Gentlemen, and a fantastic job he’s done too. His meticulous and energetic drawing style perfectly suits the Victoria-era story and his work was won him a host of new fans. As for the rest of Prog #485, it was a pretty strong issue. The Prog kicked off with part one of the Judge Dredd story Atlantis. Metalzoic came next, followed by an instalment from book six of Nemesis The Warlock, pencilled by Brian Talbot. Comedy strip Ace Trucking Co. followed with mutant bounty hunter Johnny Alpha, gunning for revenge in Strontium Dog, rounding off the issue. 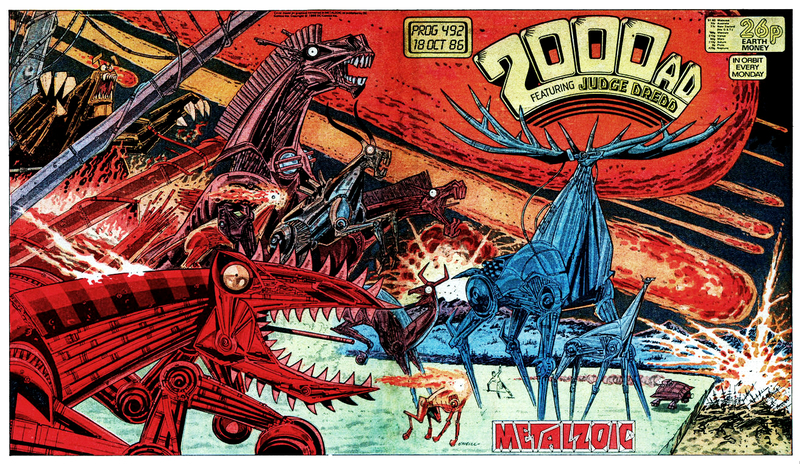 The final instalment of the Metalzoic story was printed in 2000AD Prog #492 which featured a terrific wraparound cover by O’Neill, which I’ve shown below. Great stuff. Coming soon: a classic 2000AD cover by Brett Ewins.